We are proud to introduce our newest frame profile, aptly named "Century" - as it is built to last, and is sure to be a treasured family heirloom. Constructed of 3" wide moulding with a slight bevel and elegant beading, and available in several finish choices. 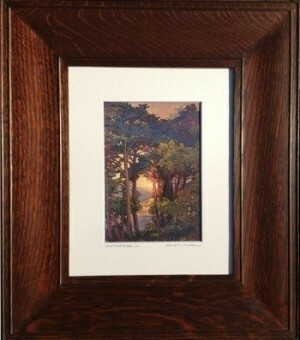 Century frames are made to hang both vertically and horizontally, so changing out your artwork over the years is easy. Standard and custom sizes available to suit many applications. All of our frames are made in our 6,000 square foot workshop by one of our five craftsmen. Dard Hunter, III hand selects every piece of quarter sawn White Oak to ensure optimal ray flake in every frame. Once the selection is made, he then turns the board into one of 5 moulding profiles which are then cut, joined, sanded and finished. Any wood that does not meet his meticulous standards is made into flooring, accounting for approximately 25% of our annual consumption of Oak. We purchase several thousand board feet of quarter sawn Oak at one time allowing us volume discount pricing which we pass on to our customers by producing the finest Mission style frame available at an affordable price. Hand made from the highest grade quarter sawn White Oak. Choose from our stock sizes on the pull-down menu below... Custom sizes are also available. Dimensions shown represent actual rear window opening. Comes in a variety of stain color options, all hand applied and polished in our workshop.